Based on recent progress in locating exoplanets outside our solar system, it is estimated that about 20% of those stars similar to our sun harbor planets in the habitable zone, meaning they could conceivably harbor Earth-like life. That adds up to an estimated 20 billion such planets in the Milky Way galaxy, and it is possible that a small fraction of those (but still an impressive number) harbor intelligent civilizations possessing advanced radio technology. It is appropriate to begin pondering how we might communicate information by radio with any extraterrestrial civilizations that might exist out there, and also with spacecraft (called starships) that we might launch toward nearby stars. In this talk we discuss the major technical obstacles to such radio communication, such as great distances, the cosmic microwave background, an ionized interstellar medium, and (for starships) relativistic speeds. 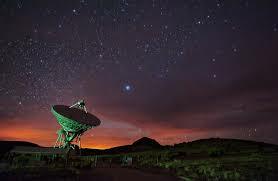 We will also predict the character of digital modes appropriate for interstellar communication.